The first two weeks of November were marked by widespread outrage, as people denounced the exploitative use of inmates’ labour to defeat wildfires in northern California. Reportedly, over 1,700 inmates, including 58 minors, were involved in fighting active wildfires. Inmate firefighters are paid an average of $1.45 per day for their work, while regular firefighters earn an average of $35.51 per hour. The dangerous nature of firefighting, combined with the sensationalized images of the fires, have brought attention to, and compassion for, the inmates who are essentially coerced into these jobs for extremely low wages without any benefits. However, this superficial outcry ignores the underlying causes that allow the historic and ongoing systemic exploitation of inmates for capitalist gain within the prison system. In 2016, US prisons yielded the highest incarceration rate in the world, with 2.29 million people incarcerated. Racist policies enforced by the police such as racial profiling, the war on drugs, or the three-strikes law, have led to the overrepresentation of Black, Hispanic, and Indigenous people within prisons. Any discussion of exploitative prison labour must be contextualized within the larger capitalist exploitation of people of colour in the US. In a capitalist carceral system, examining what is criminalized and what is not exposes its illegitimacy. Marginalized communities, such as racialized people, are systematically targeted by Criminal Codes and they disproportionately populate prisons. Yet businesspeople, murderous cops, racist lawmakers, and those who exploit and abuse workers continue to walk free, because the system is not configured to criminalize them. The intersection of racialization and capitalism results in corporations exploiting the prison population for their own profit. They capitalize on the fact that these communities are hidden from the public eye and have very limited options to organize and resist abuse. Prison labour is legally protected by the US Constitution, as the 13th Amendment does not ban forced labour when it is used as “punishment for crime.” In that context, inmates are used to produce goods ranging from clothing, food, electronics, furniture for federal offices, and military material, in supposed “rehabilitation” programs. These incarcerated workers also provide labour for the maintenance of the prisons, such as cooking, cleaning and administrative paperwork for wages as low as $0.12 per hour. Meanwhile, the federal minimum wage in the US is $7.25 per hour. When not operated by federal or state agencies, the labour programs are carried out in private prisons operated by companies such as CoreCivic and GEO Group, with whom the government has had contracts since 1997. Private prisons function as for-profit businesses and maximize their profits by reducing the costs of prisoner accommodation, essentially continuously worsening the living conditions of inmates. The exploitation of these workers is a billion dollar industry. The Federal Bureau of Prisons operates the Federal Prison Industries program, also known as UNICOR, which pays inmates an average of $0.90 per hour, while earning over $500 million in sales per year. Public prisons in the US have been providing labour for private corporations since 1979, when the government implemented the Prison Industry Enhancement Certification Program (PIECP). This created a new source of extremely cheap labour for companies such as Walmart, Whole Foods, Verizon, and Victoria’s Secret. Corporations are allowed to lease factories in prisons and to exploit inmates to produce goods at rates they would likely never be able to get otherwise. Prisoners who wish to challenge the exploitation of their labour have virtually no legal options. Prisoners in the US are not allowed to unionize or engage in collective bargaining, according to the Supreme Court’s unjust decision in 1977. While US laws allow non-incarcerated workers to resist labour exploitation to some extent, the few rights they are granted are stripped once they enter the carceral system. Private prisons are not required to pay incarcerated workers living wages, which is in violation of international labour standards. Prisoners in some US states are legally required to work and are punished when they refuse. Those who attempt to speak out against the gross mistreatment of prisoners under capitalism almost always end up facing solitary confinement or other disciplinary action. For example, Shoaib Ahmed, an inmate in one of the largest private prisons in the US, refused to work after his paycheque was delayed. To express his frustration, he encouraged other inmates to stop working alongside him. His refusal to work was met with ten days of solitary confinement, essentially coercing him into performing labour. This is in direct violation of the International Covenant on Civil and Political Rights, ratified by the US, which prohibits slavery in all forms, including forced and compulsory labour. This lack of legal protection for prison workers, alongside the punishment they face for speaking out against injustices, shows the systemic repression of dissenting voices. Prison workers are often not included in national labour movements, receiving little public support or aid. One of the only groups fighting for the rights of incarcerated workers is part of the International Workers of the World labour union. They supported the nationwide prison strikes organized by workers from August 21 to September 9, which called for improved conditions, an end to “life without parole” sentences, and the right to vote for Americans with felony charges, among other demands for basic human decency. The organizing of workers is constantly repressed by prison officials through disciplinary action such as solitary confinement, revoking communication privileges, and long-distance transfers. Amani Sawari, a representative for Jailhouse Lawyers Speak, stated that “it’s much harder for prisoners to attempt to defend their rights as workers because […] basic privileges like showers, edible food, clean clothes and […] toilet paper can be taken away in retaliation.” While some inmates have spoken in support of work programs in prison, they often support them because of the slightly better living conditions in out-of-prison work facilities and the reduced sentencing that comes with prison work. However, this system perpetuates coercive bargaining of basic human rights for cheap labour. 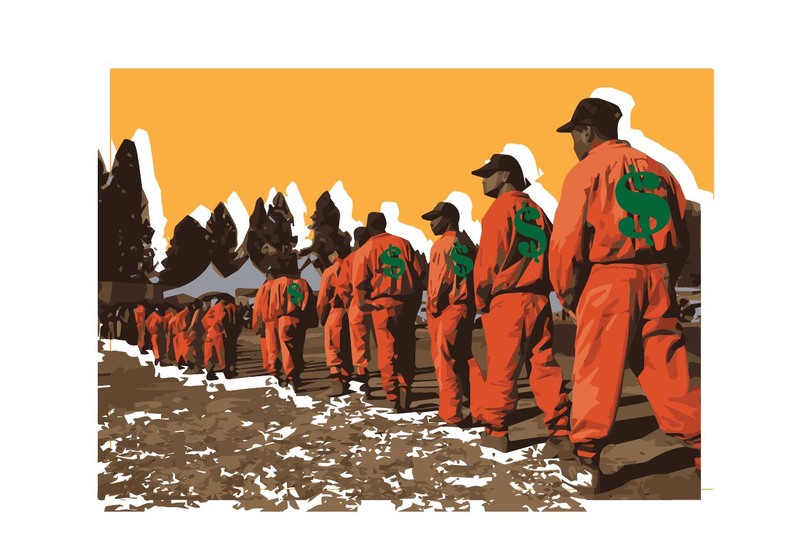 The exploitation of prison labour generates billions of dollars of profit every year, and has become an incentive for both private prisons operators and the US government to increase the prison population. The driving force behind these prison labour programs is the idea that it contributes to the rehabilitation of inmates. Many argue that prison labour will provide transferable skills useful for when inmates leave prison. They claim that giving prisoners a “purpose” prevents them from being idle and reduces violence within prisons by making them “responsible.” This argument shifts the focus away from the inherently exploitative nature of prison labour and is rooted in paternalism, infantilizing inmates, and robbing them of their agency. Once people enter the carceral system, they are dehumanized by being provided insufficient living conditions and being forced into labour. Even after leaving the carceral system, they face systemic barriers in the workplace. Inmate firefighters like the ones in California are trained and often coerced into this dangerous work, yet their prospects of continuing this work once they get released is nonexistent. Fire departments often prohibit people with criminal records from joining; for instance, a spokesperson for the Los Angeles County Fire Department stated that “someone who has been incarcerated and part of an inmate hand crew has no chance of employment with [their] agency.” Thus, the idea that prison labour is rehabilitory rather than exploitative is just pro-prison propaganda.